The SEC has released proposed rules regarding the Dodd-Frank requirement for companies to disclose their policies regarding the hedging of company securities by their employees and directors. The SEC proposes to implement Section (j) of the Securities Exchange Act of 1934 by requiring disclosure in any proxy statement on Schedule 14A or information statement on Schedule 14C of company hedging policies. Per usual practice, the SEC has opened a 60 day comment period to the proposed rules. ISS has produced a new document further clarifying its policy position on executive compensation issues for the 2015 proxy season. The document is in the form of 104 questions and answers (Q’s and A’s). We have identified 20 Q’s and A’s and have highlighted in an Exhibit those policy issues where ISS provides a change, modification, or clarification to an existing policy. Glass Lewis has announced changes to its pay for performance and equity plan models. The changes include the removal of one of its performance metrics with a new metric for companies that are in either the banking, diversified financial services, insurance, or REIT industry sectors. Glass Lewis states that it has tested the new performance metrics for these industry sectors and expects that the changes will have limited impact on their say on pay votes going forward. The Securities and Exchange Commission (SEC) has just released its proposed rules regarding the requirement for companies to report as to whether employees and non-employee directors are allowed to hedge or offset the decrease in market value of equity securities. This disclosure requirement has been mandated by the Dodd-Frank Wall Street Reform and Consumer Protection Act (“Dodd-Frank”) legislated in late 2010. The SEC is seeking public comment on the proposed rules for 60 days ending on April 20th. 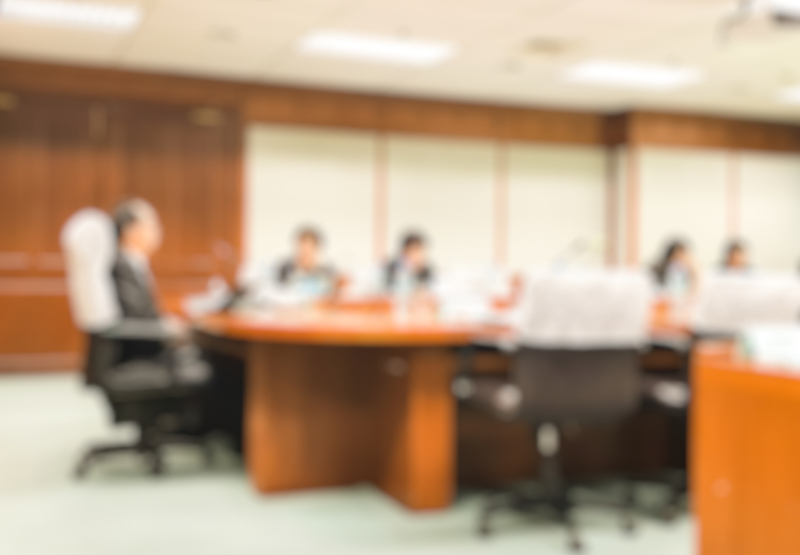 Proxy advisory firm Institutional Shareholder Services (ISS) has just released a new document explaining the firm’s latest policies with respect to executive compensation, including its say on pay advisory voting services. 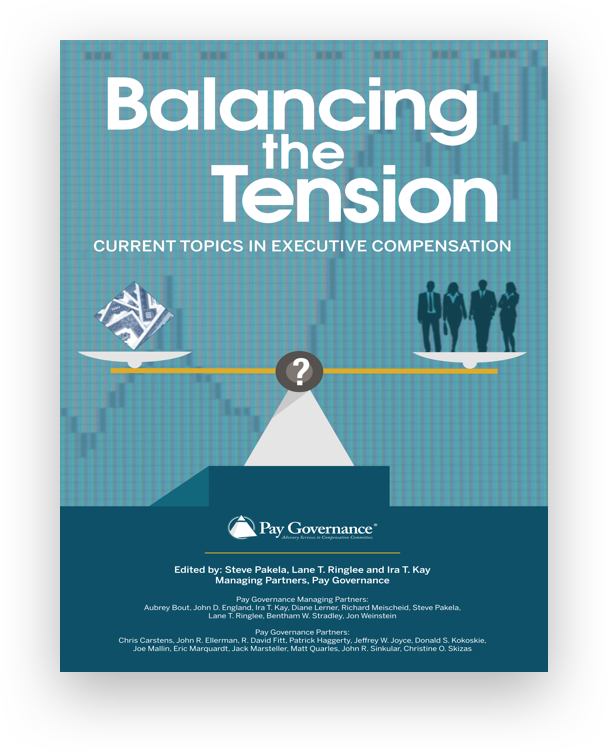 This new publication is in the form of 104 questions and answers (Q’s and A’s) and should serve as a good reference document for companies considering the ISS policy position on certain executive compensation issues. Another proxy advisory firm, Glass, Lewis & Co. LLC (Glass Lewis), has implemented changes to its pay for performance and equity plan models. The changes to the pay for performance and equity plan models includes enhancements to the performance metrics used in both models. The changes made by Glass Lewis are effective immediately and will impact the firm’s advisory voting services with respect to say on pay. 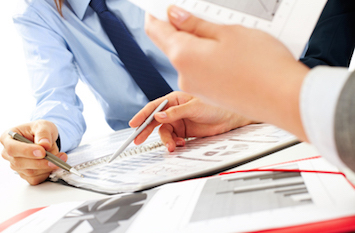 Pay Governance provides a brief overview of these developments in the following paragraphs. The Dodd-Frank financial reform legislation was enacted more than four years ago, and following its passage the SEC was directed to develop various rules and regulations pursuant to the implementation of the law. One such area requiring SEC development is the subject of disclosure of companies’ policies regarding hedging transactions by employees and directors in company securities. The SEC has proposed rule amendments to implement Section 955 of Dodd-Frank which adds new Section 14(j) to the Securities Exchange Act of 1934. Section 14(j) directs the SEC to require, by rule, each filing company to disclose in any proxy or consent solicitation material for an annual meeting of shareholders whether any employee or director or their respective designees “is permitted to purchase financial instruments (including prepaid variable forward contracts, equity swaps, collars, and exchange funds) that are designed to hedge or offset any decrease in the market value of equity securities either (1) granted to the employee or director by the issuer as part of the compensation of the employee or director; or (2) held, directly or indirectly, by the employee or director.” The SEC proposes to implement Section 14(j) by adding new paragraph (i) to Item 407 of Regulation S-K to require companies to disclose whether they permit employees and directors to hedge their company’s securities. The proposed amendments implementing Section 14(j) will require the disclosure in any proxy statement on Schedule 14A or information statement on Schedule 14C. The issuer is requested to clarify that the term “employee” includes officers of the company. The Dodd-Frank Act refers to hedging by employees, not officers, and the rule requires the issuer to affirm that their policies apply to the officers of the company. As advisors to corporate America with respect to executive compensation, Pay Governance consultants find that the vast majority of companies have already implemented anti-hedging policies with respect to their employees and directors. Therefore, we expect that this new rule by the SEC will only be a requirement for most issuers to simply disclose their existing policies as a new annual reporting requirement. On February 9, 2015 ISS released its new document which provides extensive clarification, in the form of frequently asked questions and answers, to its compensation policies applicable to U.S. companies holding annual meetings on or after February 1, 2015. More than one-half of the Q’s and A’s are devoted to ISS policies regarding the management say on pay evaluation conducted by ISS on behalf of institutional investor clients. In particular, the document explains both the quantitative and qualitative pay for performance analysis, how ISS determines peer companies for benchmarking pay and company performance, and those compensation policies of an issuing company which it considers to be problematic. 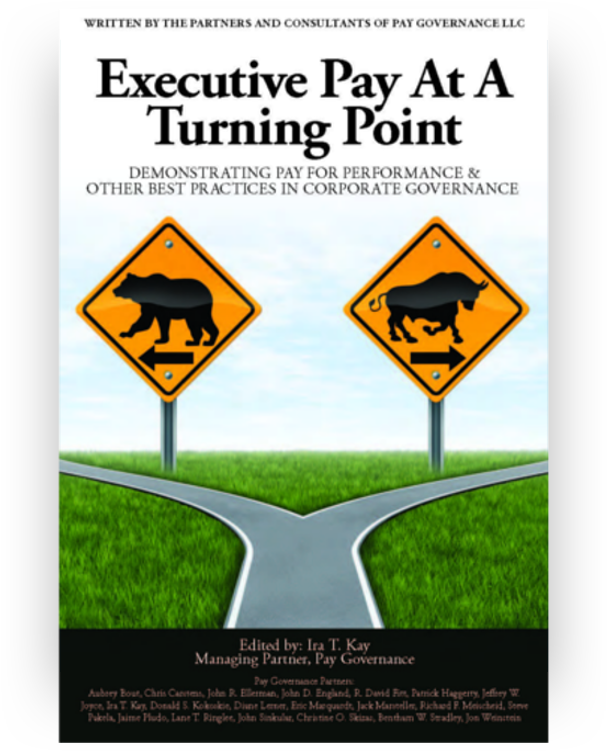 Pay Governance has reviewed the new policy clarification document from ISS. 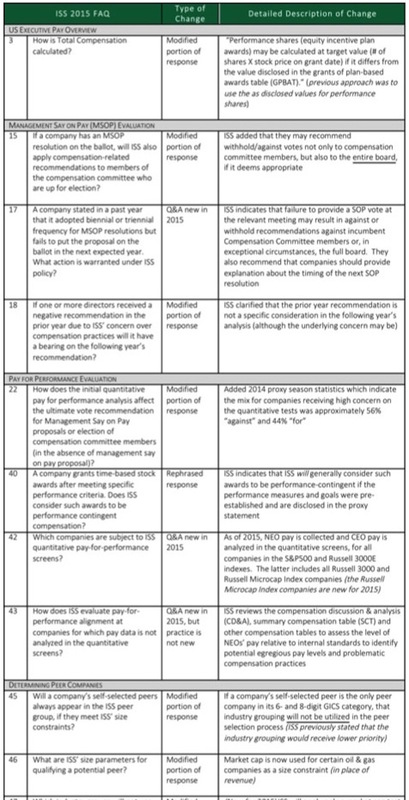 Based upon our review, we have identified 20 Q’s and A’s which represent changes or modification of existing ISS policies. In certain instances, ISS has introduced a new Q and A to identify a new policy initiative adopted by the firm. 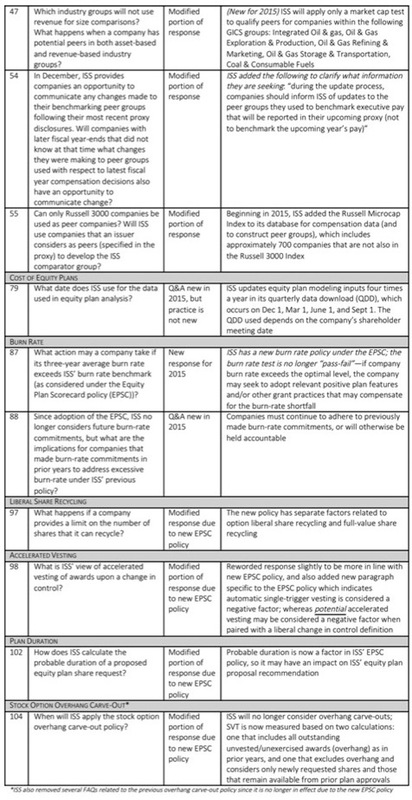 To assist you in reviewing the scope and magnitude of the changes and restatements adopted by ISS with respect to its policies for the 2015 proxy season, PG has prepared the attached Exhibit. The Exhibit identifies the policy issue, type of change, and detailed description of the change prescribed by ISS. In the Exhibit, you will find that the changes in policy specified by ISS are not of major magnitude but instead represent further clarification to their previously stated policies. ISS appears to be making a commitment to its policy of providing increased transparency to its executive compensation policies. Proxy advisor Glass Lewis has implemented changes to the performance metrics used in its U.S. and Canadian pay for performance models and its U.S. equity plan model, effective February 2, 2015. The changes made by Glass Lewis are an attempt to improve the models’ ability to assess performance of companies in certain industry sectors. Previously, Glass Lewis models measured universally the following five performance metrics: change in operating cash flow, change in earnings per share, total shareholder return (TSR), return on equity, and return on assets. Going forward, Glass Lewis has revised its metrics for banks, diversified financials, and insurance companies by replacing the metric of change in operating cash flow with tangible book value per share growth. In addition, companies which are real estate investment trusts (REITs) other than mortgage and specialized REITs will be analyzed by replacing the metric of change in operating cash flow with the new metric of growth in funds from operations. Glass Lewis has stated that it has tested the changes to the performance metrics on a historical basis and believes that the changes will have minimal impact on its pass/fail assessments for say on pay advisory votes. 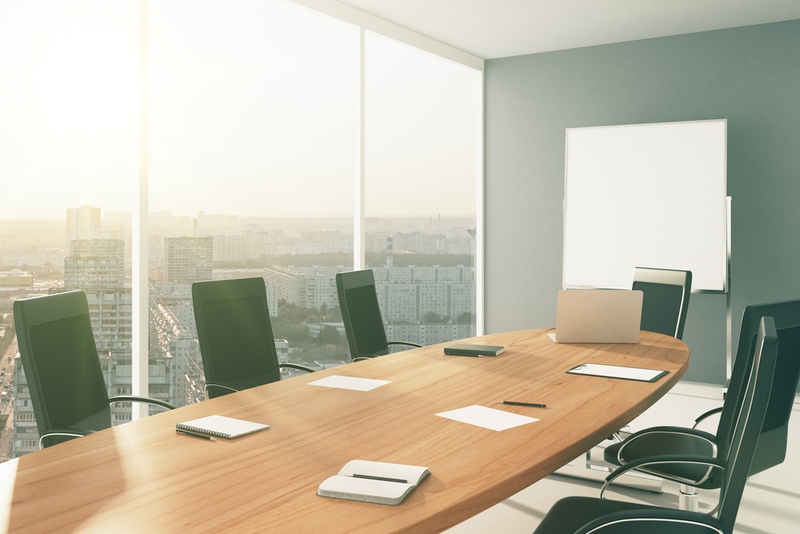 As the new proxy season approaches, the proxy advisory firms ISS and Glass Lewis have provided additional guidance as to their approaches and policies in reviewing executive compensation and say on pay advisory votes. Both firms have added minor changes to their policies in an attempt to assist companies in interpreting their policies as companies prepare their new proxy disclosures. We welcome transparency and policy changes that appear to better reflect industry fundamentals; however, we are disappointed that both firms issue these updates with little or no advance notice prior to their effectiveness. The SEC has finally produced proposed rules regarding the disclosure of pledging policies by corporate issuers and has opened a 60 day comment period, which will unlikely have a material impact given most companies have already adopted these policies (and both ISS and Glass Lewis lack comments on these policies). General questions about this Viewpoint can be directed to John Ellerman or Linda Pappas by email at john.ellerman@paygovernance.com or linda.pappas@paygovernance.com.